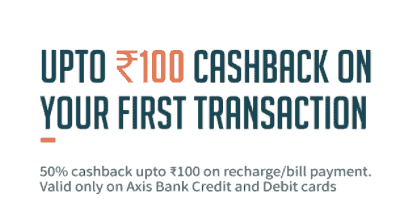 Now Apply Freecharge FCAXIS Promo Code and get flat 50% Cashback on Mobile Recharge or Bill payment. Coupon is applicable for Axis bank Card holders only and valid on your 1st ever Recharge on Freecharge.in. Maximum Cashback is 100 Rs. This coupon is valid until 31st March 2018. Follow given steps below to avail this Freecharge Axis bank offer. Now, pay your amount via Axis Bank Credit / Debit Card only. Have a look at other Freecharge new users coupons or new recharge offers too, you may find a better coupon!! FCAXIS Coupon is valid until 31st March 2018. Get 50% cashback on Freecharge on your first Recharge/Bill payment. Valid once per user. The Offer valid on transactions done on Axis Bank Retail Credit and Debit Cards only. This offer is not valid for Corporate Credit Cards and NRE Debit Cards.